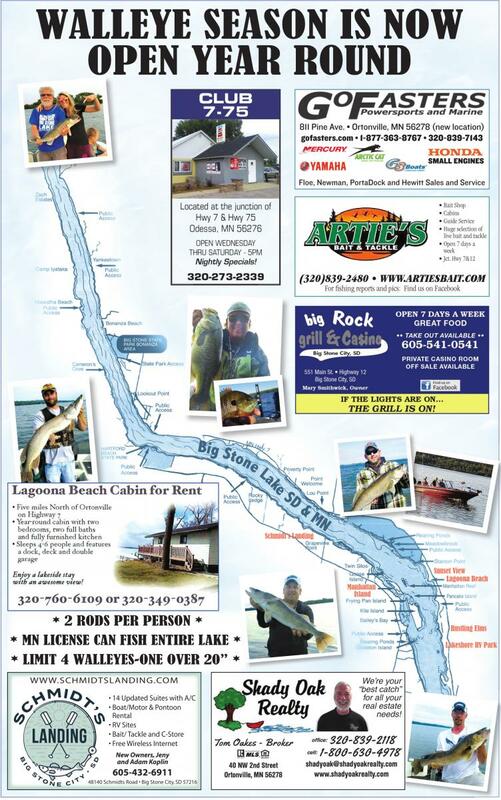 WALLEYE SEASON IS NOW OPEN YEAR ROUND 811 Pine Ave. • Ortonville, MN 56278 (new location) gofasters.com • 1-877-363-8767 • 320-839-7143 SMALL ENGINES Floe, Newman, PortaDock and Hewitt Sales and Service • Bait Shop • Cabins • Guide Service • Huge selection of live bait and tackle • Open 7 days a week • Jct. Hwy 7&12 (320)839-2480 • WWW.ARTIESBAIT.COM For fishing reports and pics: Find us on Facebook * 2 RODS PER PERSON * * MN LICENSE CAN FISH ENTIRE LAKE * * LIMIT 4 WALLEYES-ONE OVER 20” * WWW.SCHMIDTSLANDING.COM • 14 Updated Suites with A/C • Boat/Motor & Pontoon Rental • RV Sites • Bait/ Tackle and C-Store • Free Wireless Internet New Owners, Jeny and Adam Koplin 605-432-6911 48140 Schmidts Road • Big Stone City, SD 57216 We’re your “best catch” for all your real estate needs! We’re your “best catch” for all your real estate needs!